Yes, I think that is the inevitable future. It is predetermined unless one of two things happen. One is that the world growth rate picks up spectacularly, and we have breathing space to do this kind of thing. The other is if we have a crisis that forces attention - but an economic crash will not do it, as everyone will go for their own best interest. The other point is that you can go on having treaties of marginal stuff and "invisible" issues that worry only the bureaucracy. After a few decades, that stuff is as strong as the threads that tied down Gulliver. The lesson I get from Europe is that if you only think about the high level, "nice to have" issues, you lose the economic and sociopolitical logic that will allow the thing to work. Europe is a bit like a state airline, all spiffy livery and shiny surfaces, but underneath you ask why you need it at all. What doe sit do that a free trade area does not? Apply that to this issue and you always get the same question, which is "What are we trying to achieve here?" If the answer is to protect - I don't know, plant breeders' rights or the trade in birds' eggs - then it is pretty easy to get an accord and implement it. If the answer is grandiose and generic, then it is not. I recall you (Ed.) saying that you can order an army to conquer a country, but not to install the spirit of democracy in it. Sure, they can impose votes and assemblies, but not the right state of mind. The same is true of grand ambitions for international amity. Like how many psychiatrists to change a light bulb? One, but the bulb has to really want to change. I want to comment on soft power, particularly as it applies to Asia. We have very dissimilar nations that are closely locked together by geography and trade - not at all like North America or Europe. There are no real advantages to be won by military aggression, except in a few key enclaves and in respect of ocean natural resources. Vulnerable nation states will cease to be economically useful if they are seized, this is pretty clear to all. You get unstable nations that may behave irrationally, but we do not have to many of those in the region. Then you have US sea power set up against China, basically to contain its naval ambitions. More than anything, China wants stability. It has a major demographic challenge to overcome, funded by savings that have been eaten away at by inflation and low returns. It has a myriad of ethnic conflicts. Its people remain basically optimistic and forward oriented, but they are increasingly affronted by official corruption and the power of local government in the hands of local mafias. There are estimated to be several hundred violent protests every day, virtually all of them associated with this issue, and with labour relations. Consequently, where a major power will turn to project its power is through the so-called "soft" routes: diplomacy, commercial engagement, investment and favoured trade status, outright clienthood and espionage. One has to ask what China would like to achieve through these media. Unlike former communist powers, it has no interest in fomenting international revolution. It does not want to add significantly to its territories. What it does want is stability for its trade, a lack of external threat and an absence of sponsored subversion within. It is terrified by the notion of resource scarcity and, lacking confdence in free markets, it is trying to acquire minerals and energy supplies on a tied basis. Its companies are miserably bad at doing this when they get away from the protective and well-understood home environment - shades of Japan in the 1960s. There is a tendency to imagine that foreign states can issue binding orders to their home companies about who to sell to and at what price, and to communities as to what they will accept. If China's commercial outreach has been weak, its active and often informal diplomacy, it helpful approach to capacity building and institutional growth and its relations with (most) existing regional powers has been much stronger. The enormous economic weight that it imposes on the regions does, of course, help. China is therefore best seen as a mature man, moving into prosperous middle age. It is not a violent young power, although formidable and capable of violence if forced into it. Its greatest concerns are internal, and its primary concerns with the outside world are as a market, a source of raw materials and as the potential source of instability. To the extent that it is building a network of middle income powers - Russia, Brazil, the 'Stans - its is doing this as a way of avoiding capture by the current talking shops, such as the G20. Internal tensions are bound to rise. China has to shift from mass manufacture, and this will further widen income gaps. Low income cadres will be affected through high world resource costs and the general slow down, and by the emergence of further economies such as Indonesia, trading within its current activity band. Labour movements must arise in the medium term that have a dramatic impact on wages. I have already mentioned demographics. Consequently, China will have no motive for overseas adventures that are not designed to soften these pressures. I therefore cannot see any change in this posture that is not forced onto China by events in the 2025 period. China has been talking to a variety of non-aligned middle income countries, most notably Russia, Brazil, India and South Africa about the possibility of a common pool of foreign currency. Such a pool could, in the long term, perhaps lead to an agreement to index national currencies against this, in the manner of the European ERM. Quote from China Daily: "According to the Chinese Foreign Ministry, the leaders discussed the currency swap and foreign-exchange reserve pool ideas and tasked their finance ministers and central bank chiefs to implement them". One point that makes this more than general talk is the apparent offer from the Chinese central bank to put $3 trillion into such a fund. One interpretation is that this is something of a "rainy day" fund that does not depend on current reserve currencies or the IMF. Another is that it is a first step towards a new reserve currency. Either way, China is likely to have great influence over the development, and this is another example of thoughtful soft power. And, of course, of having a means to avoid surprises. One could imagine a scenario where the availability of an insurance fund to absorb low risks gives nations the confidence to keep a smaller safety buffer of dollars, which would decrease demand for dollars. Hard to say whether this would ultimately threaten the dollars status as a reserve currency, but may diminish it. The same China Daily article notes that this group supported the IMF and its role, mentioning that this possible agreement could further the task that it has set itself. These five countries have about 42 percent of the world's population and more than a quarter of its land. Their combined nominal gross domestic product is $13.6 trillion, about 19.5 percent of the global total. Roughly half of all world output growth in the past year has come from them. All this about China is interesting, but a bit peripheral to the question that was asked: What If the world breaks into splinters and a central collaborative group? I was looking at your older scenarios, and see that you have already had some thoughts about this. Indeed, it is from here that the now widely-used term, the Anglosphere, seems to have developed. Hurrah, as Zoidberg might say. There seem to be two logics for such a development. One is exclusive, the other affiliative. The "exclusive" model rejects these who cannot play or will not play be the rules. It could be extended to politically incompatible regions, as a sort of new cold war. The affiliative model arrives at similar outcomes by more positive means - in essence, those most like each other link up most strongly, and de facto blocks emerge as legislation captures the essential needs of this. How would this differ from free trade? Well, it would happen if economics became less important than other things, such as the environment, military security and so on. I recall something on this from the first paper, where you talked about a "club of the capable". So, then, we can extrapolate to three general models. We get an exclusive one, where some part of the world goes sociopolitically AWOL. The most obvious model revolves around oil and religion, say no more. However, a protectionist Europe filled with old people and workers with an unrealistic expectation of the wages due to them is at least as likely, if not more so. Protectionism is a ever-present danger in 2025. We get an affiliative one, and here the BRICS grouping discussed above is really important. Also important is the notion of non-statal, non-geographical affiliation, from labour movements to science, commerce and so forth. Those who can play enter, but they have to prove themselves and gain trust, like you say elsewhere. Third, you get business as usual: free trade, market clearing, multilateralism in general. For that to happen, we need to solve IP issues - TRIPS is not properly implemented - and we need to set up a whole bunch of institutions, primarily financial in order to stop bubbles and damp oscillations in the system. Lots tell you that we need similar environmental controls: fine, but I can't see the mechanisms to put them in place. If we had solutions that did not involve blocking paths to what people want to do, then they might happen. If not, then they won't. OK, so that give three pretty distinct scenarios - not that I am trying to nudge your elbow. The details of what ad how need to be filled in. But I can't see a fourth alternative - can you? There has been limited discussion on military security in this world. To the guy with a hammer, everything looks like a nail was never truer when you have a colossal military and intelligence establishment. I recall the dismay that greeted the end of the Cold War amongst those who had made a living out of it. Intelligence was to be re configured to worry about drug dealers and money laundering: vast career prospects there. Then Bill Nye invented the notion that if we built up our (US Ed.) forces to an insuperable level, nobody else would bother to arm at all, as we would be unchallengeable. Just as the re-engineering wave - and Y2K, and the dot-com bubble - all got the enthusiastic support of IT staff who wanted bigger computers - this was just what the doctor ordered from the military and their suppliers. Successive Presidents bought it, and we built up a huge machine for fighting conventional main battlefield war, and a huge intel engine for - er - something. The war on terror gave both of these something to do. Think what these forces would be doing right now, if these various operations had not been conducted: not a great deal. In 2007, Zbigniew Brzezinski, Jimmy Carter's National Security Adviser, told the Senate that the war on terror "has become so overblown that it is a mythical historical narrative. He called Iraq a "historic, strategic and moral calamity". Whatever the truth in that, the US has spent at least four trillion dollars on these recent adventures, acting against an enemy that is so diffuse as to be nearly indefinable. Does el Q'aeda exist, except as a concept and a franchise - and do not most of the jihadi ideas permeate a hundred organisations that spring up when the collective is threatened? What, indeed, would such a victory look like? That these guys woudl stop being rude about us? That they would settle down to polite middle class lives? What specifically military order can you give in respect of this kind of outcome? The original neoconservative model suggested that repressed societies, when liberated, would immediately see the light and would convert to open democracies. This would further stimulate positive change in their peer nations. Iraq, secular, literate, disciplined, would quickly be liberated from Ba'ath repression and joint the club of free nations. This is plainly wishful thinking at best, and was demonstrable nonsense at worst, long before any serious intervention had been made. In summary, if you build a major interest group into your government, you are going to get what they want a great deal of the time. The US has two such interest groups, the military complex and commerce. Europe does not - it chief interest group seems to be welfare providers. In Japan, the interest lies in people who do not want the equilibrium shaken, in case something collapses. China has an innate collision between expansive and exploitative commerce and a state (and army) that want to keep everything stable, to keep the good times rolling, without accepting the inevitable collateral from that. One can go on, but I will not. America will, however, tend to seek a new enemy as the current withdrawal from Afghanistan runs down, and it concerns me deeply that this 'enemy' may be China. Geopolitics as a concept requires what political scientists call "agents", entities with opposing or similar interests, and events. Let me list four events that I think are potentially significant. One can, of course, come up with an endless list of these - epidemics, crop failures, meteor impacts - but I am here looking at step changes, after which everything is different. Major oil price hike of a semi-permanent nature; perhaps due to chaos of intense political change in a major producer. Equivalent changes for crucial resources - phosphate, copper - are less credible, due to diffuse sources, considerable time-related buffers, in some cases enhanced recycling. Clear, significant signature of climate change. Perhaps clear sign of catastrophic ecological simplification along the lines of eutrophication, bacterial blooms and so on. Systemic, intractable instability in world financial systems, particularly in regards to state finances. Emergence of a fast-propagating ideology - with or without a religious dimension - that expresses alienation from the current world order and economic system. A new communism, so to speak. Each of these triggers a separate set of agents to form interest groups. Notice, however, that whilst some issues generate responses at the level of the nation state - for example, around supply crises, where the agents are producer and consumer nations - in others they are not. Ideologies are addressed at the level of population segments, much as countries like Indonesia have Islamist interests that may have more in common with the Muslim umma than with the nation of which they are citizens. The Cold War showed similar phenomena, where class solidarity and communist party membership were supposed to come before patriotism or citizenship. I am not going to list the possible agent configurations, as these are self-evident. One issue that I do want to raise is the following. Demographics, emerging economy growth and sclerosis in the industrial nations imply major change. Those most hit by this are those with the least skill. Political movements that reflect this can easily propagate internationally. Europe, in particular is developing a strongly protectionist lobby. The question that its nations have to ask themselves is this: is it better to integrate, generate growth so as to raise taxes, and use these to sponsor state projects that offer employment, or is it preferable to shut the doors, to force companies to be inefficient in their use of labour, and to accept lower growth as a result? The rational mind, surely, reaches for the first option. Only if a country felt that it was incapable of economic renewal and faster growth would the second option make more than short-run sense. Now, I turn to your question - competent core and the rest, or advance as a Brotherhood of Humanity? There always has been the "core" and I think that there always will. Could the core fight amongst itself? It has in the past, but it is hard to think of a project that would trigger such strife. If the Euro had worked, the Atlantic might have been spanned by a dollar-euro conflict of a gentlemanly nature. Could a new Asian core arise that was different from and in some ways hostile to the "old" core? Undoubtedly it could, but what purpose would it serve? Could a block form around those which feel that they ought to be at the top table but who are not, in the manner of the non-aligned group? These exist, of course, and they are ineffectual for the very reasons that that they are not at the top table. So, definitely a core, and one core only. Peripheral interests may well form other cores, depending on the issues. China will acquire satellites and will impose its will in respect of its regional interests. It has shown some sensitivity in doing this to date. A grudging, sclerotic Europe coudl very well be another peripheral group. One point that comes up a lot in South-East Asian security circles is how we survive with to huge powers and lots of little ones. It seems to us that forming another maybe-big power des not really help, because the basic problem is to do with big powers. If you have many small powers, if one of them wants something badly they have to listen to the to others. Solutions come through politics. If you have one big power, they take what they want - really, they change the language so that what they want is "good" and everything else is worse. When they "stability", for example, they mean "under our control". But nobody can be against "stability"! When you have two big powers, the whole area is dominated by their rivalry. It is more important to one that they win over the other than they get to a good place in policy or debate. External affairs gets dominated by people with military training, who want to win, not to smooth things down. So, I am asking if a secure world is one with lots of medium powers, not a superpower or a block of nearly-superpowers. It would be a lot easier to talk to sensibly with like, California, not the whole US. Nobody wants to talk to the EU, but they do like to talk to Germany, France, Britain. OK, so fantasy; but that is pretty much what is happening with all practical economics issues that do not involve the central banks. I also see that small states grow better than big states once they get rich. OK, not so big sample, but still it feels right - a Singapore or a Denmark is easier to manage than a US or a China. So maybe we see that the future is about national down sizing. How does this work? Well, if you fix things at the right level you can let the rest do things at their level - subsidiarity. China tries to everything at one level, and then has to let local prefectures and so on do what they like in a sort-of illegal way further down, but all the time pretending that it is centrally controlled. That does not work any more than central planning worked, and when they see that they are like the Coyote in Road Runner, off the edge of the cliff, well that's too late. So I think maybe big countries have to think about pushing more power and choice down and for the main government to do like co-ordination, protect environment and minorities and stuff like that. Then we have proper discussion inside country and outside, because each little bit has its own views and everyone else has to listen. There are three parts to this figure. The little brown insert at the top right shows the proportion of the world's nominal gross product attributable to certain blocks. The top ten nations create 70% of the world's wealth, and so they have something fo the same level of power to do constuctive things. The rest of the world is reduced to suggestions and to blocking manoeuvres, whatever their alignment. The inner pie chart shows the top ten economies, split by their relative share of world product. The scale of the US is evident: it takes China and Japan to equal it. However, its capital stock is immensely larger than either of these. It may have a weakness in its human resource, but its political and economic model is geenrally copied because it is so effective. 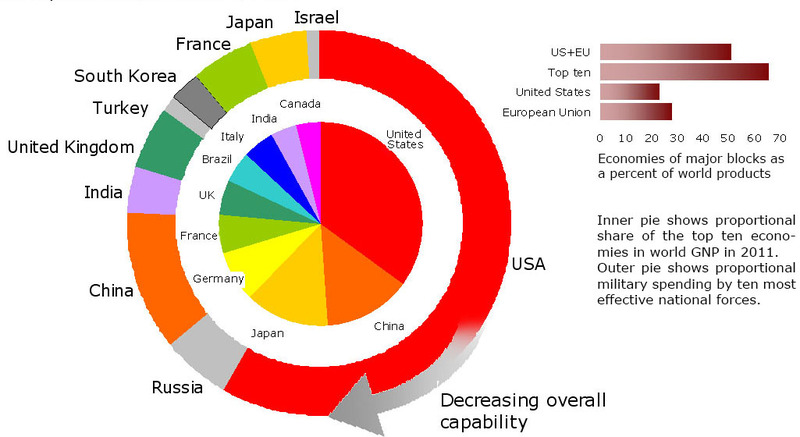 The outer ring shows annual military spending, keeping the same colour code as the inner pie chart wherever possible. The nations are arranged in descending order for their assessed military effectiveness. That is, spending in any one year does not relate well to the stock of equipment in place, the human resource trained or the overall systems integration. The rank order is generated by a complex assessment process (it is a process which de-rates nuclear power) and a partially subjective one. But we checked against six other reputable indexes - e.g. SIPRI, ISS - and got similar or identical rank order from these. From this outer ring you can take the message that the US is very far from falling from its place as super-powerin military matters. Our assessment of soft power was that the US position was weaker, but not by much. Additionally, its economic weight comes as much from its capacity to innovate as much as the bulk of its activity - much Asian growth has come from taking in the US's washing, often improving and always cheapening it, but not from front end innovation.